The same day the Service Employee International Union (SEIU) was scheduled to launch a campaign to push the city to raise pay for 3000 to $15 an hour, city officials proposed raising the hourly pay to $13 across the board. The city budget for the next fiscal year is introduced this week. 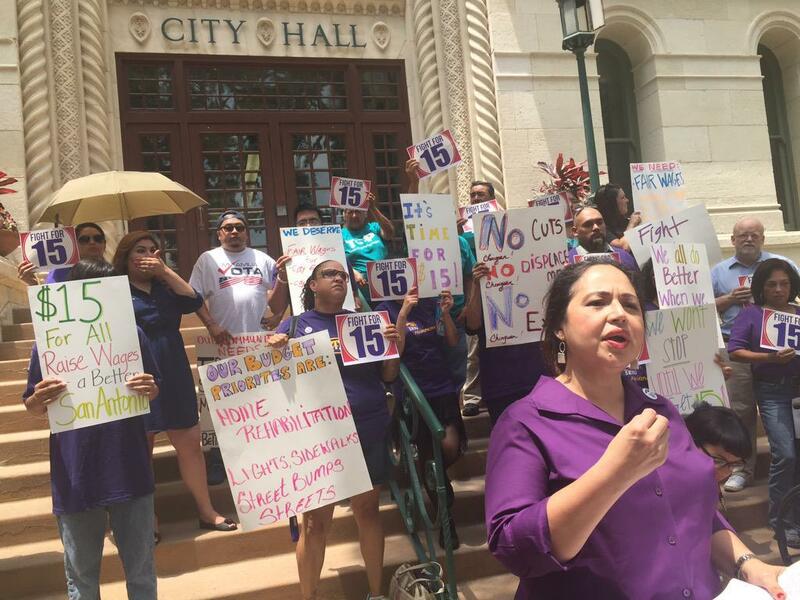 COPS/Metro Alliance, a nonprofit advocacy group based in San Antonio, has been trying to get the wage lifted to this rate for more than a year. They first pushed at the County Level last summer. What does the new rate of pay mean for workers? Will it be good for the overall economy? This question of what to do about the minimum wage, which remains unchanged at 7.25 since 2009, is being asked nationally. Seattle passed requiring businesses raise the minimum wage to $15 an hour by between 2017-2021. New York state is looking at raising it for fast-food workers to $15 by 2018 in New York City and by 2021 in the rest of the state. Many have predicted the moves will raise prices and limit employment for the least skilled. The federal minimum wage has been $7.25 since 2009. That amount, or something less for exempted positions, is what 3.3 million Americans earn per her hour across the country. Many believe it is time to raise the minimum wage to a livable wage, or a wage that raises a person out of poverty. Last week the City of Houston adopted a strict ordinance that will disqualify businesses found guilty of criminal wage theft from city contracts or from operating in the city. Officials have said criminal convictions rare in these instances, but the city contends it makes a powerful statement. As part of a nationwide protest in over 60 cities, fast-food workers from Austin and the surrounding area walked off their job sites in protest of better wages from their employers. Jennifer Castilla works at an Austin area Wendy’s Restaurant. The mother of four children makes $8/hour. "I feel sorry for the ones who make lower than I do and that have as many kids as I got," Castilla said, "but I understand the struggle in life. I’ve been struggling my whole life in fast food and I figure now is the time to step up."